, the different ways you can choose to highlight your website's content in search has grown dramatically. In the past, we've called these rich snippets, rich cards, or enriched results. Going forward - to simplify the terminology - our documentation will use the name "rich results" for all of them. 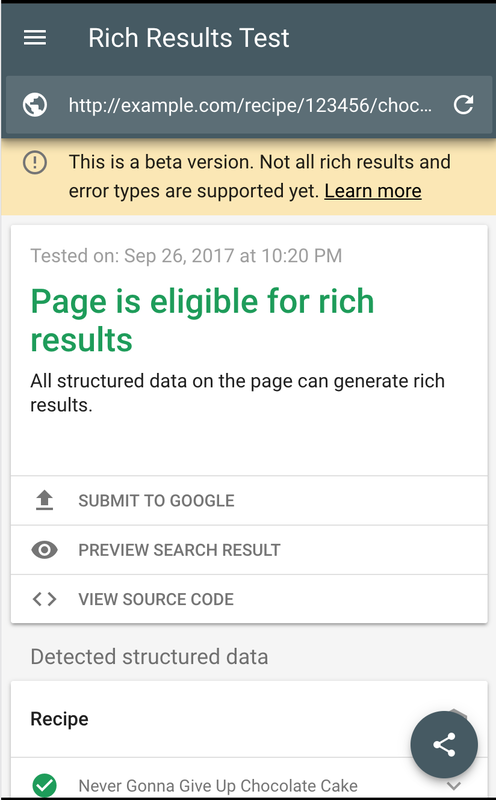 Additionally, we're introducing a new rich results testing tool to make diagnosing your pages' structured data easier. The new testing tool focuses on the structured data types that are eligible to be shown as rich results. It allows you to test all data sources on your pages, such as JSON-LD (which we recommend), Microdata, or RDFa. The new tool provides a more accurate reflection of the page’s appearance on Search and includes improved handling for Structured Data found on dynamically loaded content. The tests for Recipes, Jobs, Movies, and Courses are currently supported -- but this is just a first step, we plan on expanding over time. Testing a page is easy: just open the testing tool, enter a URL, and review the output. If there are issues, the tool will highlight the invalid code in the page source. If you're working with others on this page, the share-icon on the bottom-right lets you do that quickly. You can also use preview button to view all the different rich results the page is eligible for. And … once you're happy with the result, use Submit To Google to fetch & index this page for search. Want to get started with rich snippets rich results? Check out our guides for marking up your content. Feel free to drop by our Webmaster Help forums should you have any questions or get stuck; the awesome experts there can often help resolve issues and give you tips in no time! Over the years, the different ways you can choose to highlight your website's content in search has grown dramatically. In the past, we've called these rich snippets, rich cards, or enriched results. Going forward - to simplify the terminology - our documentation will use the name "rich results" for all of them. 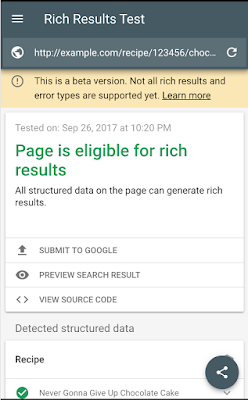 Additionally, we're introducing a new rich results testing tool to make diagnosing your pages' structured data easier.